I’ve wanted to make cheesecake for a long time. Well, I still haven’t made one but these squares were the next best thing. The taste of cheesecake but a lot easier! Preheat oven to 325 degrees F (160 degrees C) and place the rack in the center of the oven. Have ready a 9 x 13 x 2 inch (23 x 33 x 5 cm) square baking pan that has been lined with aluminum foil across the bottom and up two opposite sides of the pan. Set aside. Cheesecake Filling: In the bowl of your electric mixer, or with a hand mixer, beat the cream cheese until smooth. Add the sugar, lemon juice, and vanilla extract and beat until smooth. Add the eggs, one at a time, beating until incorporated. Scrape down the sides of the bowl, as needed. Pour the cheesecake filling over the graham cracker base and bake for about 20 minutes or until the cheesecake batter is just set. Remove from oven and place on a wire rack to cool. 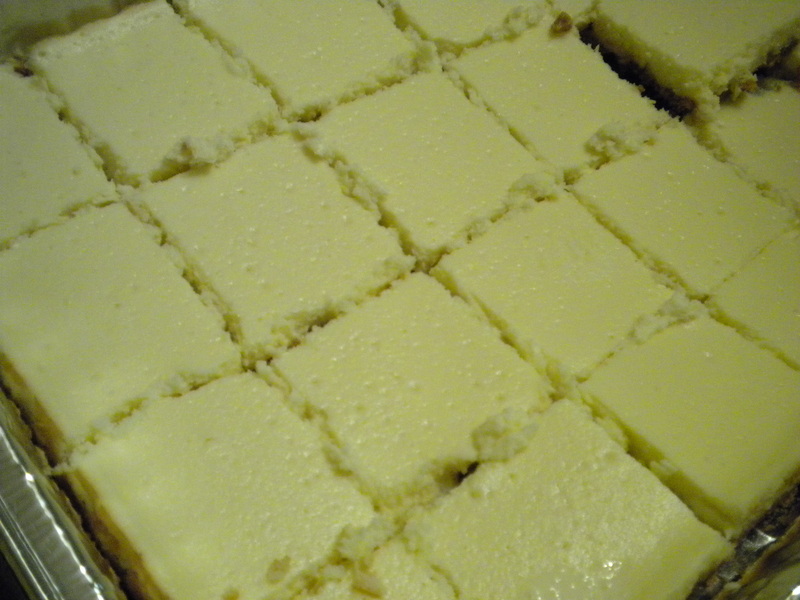 Place in the refrigerator for a few hours to make the squares easier to cut. To cut into squares – place on a cutting board, remove the foil, and with a sharp knife, cut into 2 inch squares. Have a damp cloth on hand to wipe the knife between cuts. Makes about 24 – 2 inch (5 cm) squares.